Biological Questions. I am interested in the population genomics of microbial species. The main focus of my lab is the comparative analysis of multiple genomes of the Lyme disease pathogen. The goals of my research include reconstructing the history of worldwide diversification of the Lyme disease bacteria, an understanding of the mechanisms of their genome evolution (e.g., the roles of recombination and natural selection), and inference of gene and genome functions. My Research Approach is bioinformatics, and more specifically, the computational and statistical testing of evolutionary hypotheses. Students learn and use modern computational tools such as relational database/SQL, Perl/BioPerl, and statistical computing with R.
Schutzer SE, Fraser-Liggett CM, Qiu WG, Kraiczy P, Mongodin EF, Dunn JJ, Luft BJ, Casjens SR (2012). Whole-Genome Sequences of Borrelia bissettii, Borrelia valaisiana, and Borrelia spielmanii. Journal of Bacteriology 194: 545-546. Haven J, Vargas LC, Mongodin EF, Xue V, Hernandez Y, Pagan P, Fraser-Liggett CM, Schutzer SE, Luft BJ, Casjens SR, Qiu WG. (2011). Pervasive Recombination and Sympatric Genome Diversification Driven by Frequency-Dependent Selection in Borrelia burgdorferi, the Lyme disease Bacterium. Genetics. 189:951-966. Chavadi SS, Stirrett KL, Edupuganti UR, Vergnolle O, Sadhanandan G, Marchiano E, Martin C, Qiu WG, Soll CE, Quadri LE. (2011). Mutational and phylogenetic analyses of the mycobacterial mbt gene cluster. J Bacteriol. 2011 Aug 26. 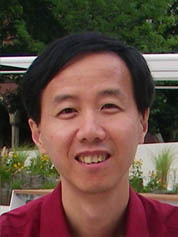 Weigang Qiu. (2011). A Review of Lyme Disease: The Ecology of a Complex System by Richard S. Ostfeld. The Quarterly Review of Biology 86 (3): 241. Xie XF, WG Qiu, PN Liple. 2011. Accelerated and adaptive evolution of yeast sexual adhesins. Mol. Biol. Evol. 28 (11): 3127-37. Sherwood R. Casjens, Claire M. Fraser-Liggett, Emmanuel F. Mongodin, Wei-Gang Qiu,John J. Dunn, Benjamin J. Luft, and Steven E. Schutzer. (2011). Whole Genome Sequence of an Unusual Borrelia burgdorferi Sensu Lato Isolate. J. Bacteriology. 193:1489-1490. Schutzer, SE; Fraser-Liggett, CM; Casjens, SR; Qiu, WG; Dunn, JJ; Mongodin EF; Luft, BJ. (2011). Whole-Genome Sequences of Thirteen Isolates of Borrelia burgdorferi. J. Bacteriology. 193:1018-1020. Wywial E, Haven J, Casjens SR, Hernandez YA, Singh S, Mongodin EF, Fraser-Liggett CM, Luft BJ, Schutzer SE, Qiu WG. (2009). Fast, adaptive evolution at a bacterial host-resistance locus: The PFam54 gene array in Borrelia burgdorferi. Gene. 445:26-37. Tran D, Haven J, Qiu WG, Polle JE. (2009). An update on carotenoid biosynthesis in algae: phylogenetic evidence for the existence of two classes of phytoene synthase. Planta. 229(3):723-9. Arva NC, Talbott KE, Okoro DR, Brekman A, Qiu WG, Bargonetti J. (2008). Disruption of the p53-Mdm2 complex by Nutlin-3 reveals different cancer cell phenotypes. Ethnicity and Disease. 18(S2):1-8. Otoo HN; Lee KG; Qiu WG; Lipke PN. (2008). Candia albicans Als adhesins have conserved amyloid-forming sequences. Eukaryotic Cell. 7 (5):776-82.